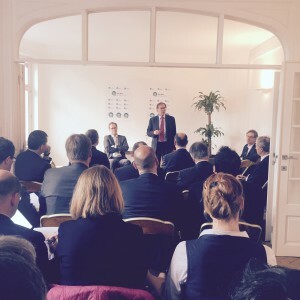 Joost Korte, Deputy Director General at the European Commission, outlined the key challenges ahead for the EU agriculture and food sector and explained how important the on-going changes, driven by President Jean-Claude Juncker, are. These changes relate to the structure of the new Commission, its working methods and priorities . Under the lead of Vice-president Timmermans, each Commissioner is instructed to undertake a critical assessment of policies and to ask the question as to whether such policies are absolutely essential at European level. Further, before any new major initiative, a consultation process and analysis phase has to be undertaken before a proposal could formally be adopted by the Commission, this takes up to 42 months. As such the Juncker Commission has defined the European Union’s key priorities with three key words – growth, jobs and investments. In general Mr Korte found that the CAP was in much better shape than when he left DG 17 years ago given the reforms undertaken. With a Budget the size of 55 Billion € it was, however, still attracting much criticism. The Commission was very much alone in defending the CAP. Criticising the implementation even before major elements of the 2013 reform were actually in operation was unfortunate, providing ammunition to those who were critical of the CAP and the EU. Mr Korte gave insights into the short and long term challenges for the agricultural and food sector and related EU policies that are under the responsibility of the EU Commissioner for Agriculture and Rural Development, Phil Hogan. He highlighted the importance: of building bridges between the CAP and other EU policies and to show CAP’s capacity to generate concrete outcomes ; of implementing the recent reform ; and of delivering in terms of simplification. The simplification process should, however, not be used for an early opening of the basic legislation as decided by Council and EP. What the Commission could do is to see what could be done under secondary legislation, a process which was now in full swing under the Latvian Presidency. The focus on simplification doesn’t mean that the Commission will become inactive as was shown through the measures taken in relation to the Russian import ban. Another example was the 1 year anniversary of the Milk Market Observatory which had been welcomed all around and served as model for other sectors. EU agriculture is vulnerable due to the big diversity in terms of farm structures with many small and fewer big farms. This makes the EU vulnerable to external factors like the Russian import ban and the volatility of market prices and demand. The Commission is working on these challenges and Mr Korte referred to 2 upcoming commitments : (1) the formulation of a new Multiannual Financial Framework for the next 5 year period (2020-2025) and (2) the 2017 report on the Greening of the DP’s from the CAP 2020 reform. Commissioner Hogan is working on these issues while acutely aware of the procedures and timing involved. Mr Korte strongly underlined the need to develop indicators in order to assess the impact on the ground of the decisions that are taken by the EU, as well as the need to reflect on the evolution of policies in the long term. 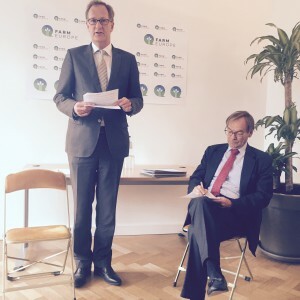 In this respect, Mr Korte welcomed the Farm Europe initiative and its effort in bringing all involved actors together within the think tank, noting that he is looking forward to collaborating with it.